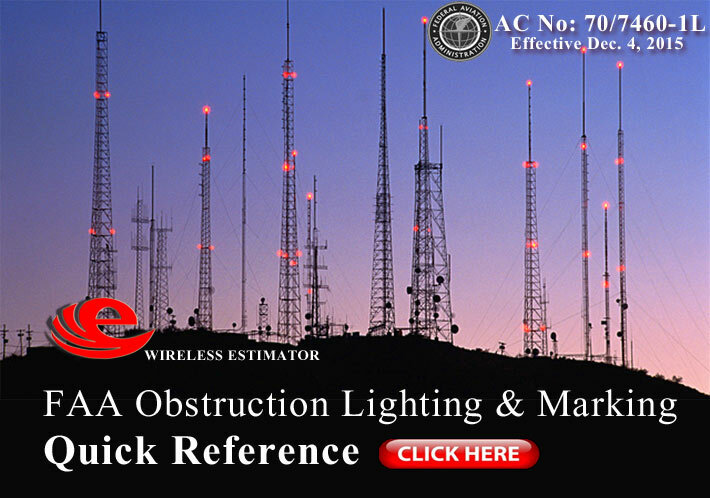 Last December, the FAA established new obstruction lighting and marking rules, and Wireless Estimator developed a handy industry reference tool that breaks down and easily explains the 90-page document’s changes from the previous advisory circular. However, the most current regulations will likely be changed again by the FAA within the next year when certain towers, in the 50-to-200-foot in height range will be required to be marked. When the president signed the “FAA Extension, Safety and Security Act of 2016,” legislation allowing the FAA to continue operations through Sept. 30, 2017, tucked away in the 51-page rule was Section 2110. TOWER MARKING, a new requirement whose genesis came from a concern for crop duster pilots who had to fly near meteorological towers that were not marked. However, the rule w ill affect a great many of other existing towers that previously did not have to be marked. The FAA will have to develop a nationwide geographic map since one currently does not exist showing those areas. The legislation also requires the FAA to “develop a database that contains the location and height of each covered tower”. It also states that use of the database may only be used for the sole purpose of aviation safety. But it is likely that the information will be used for a number of purposes, one being an excellent resource for tower consolidators to identify towers under 200 feet that are currently not in the FCC’s database. When the rulemaking process begins there will be a number of questions that tower owners will need to present, such as, if a broadcast tower is adjacent to its transmission building, would that structure be excluded? And what length would the FCC consider as being adjacent? The present marking guidance provided by the FAA states that towers, 50-feet to 200-feet must be marked with seven equal paint bands, starting at the base with aviation orange. The current regulation provides voluntary marking standards for meteorological towers that are less than 200 feet. Once the final regulations are introduced, non-conforming structures will be required to be marked accordingly with one year. Those benefiting from the new rules, in addition to pilots, will be professional tower painters and suppliers. (a) In General.—Not later than 1 year after the date of enactment of this Act, the Administrator of the Federal Aviation Administration shall issue regulations to require the marking of covered towers. (b) Marking Required.—The regulations under subsection (a) shall require that a covered tower be clearly marked in a manner that is consistent with applicable guidance under the Federal Aviation Administration Advisory Circular issued December 4, 2015 (AC 70/7460–1L), or other relevant safety guidance, as determined by the Administrator. (2) a covered tower constructed before the date on which such regulations take effect is marked in accordance with subsection (b) not later than 1 year after such effective date. (BB) used for agricultural purposes. (V) is a street light erected or maintained by a Federal, State, local, or tribal entity. (B) UNDEVELOPED.—The term “undeveloped” means a defined geographic area where the Administrator determines low-flying aircraft are operated on a routine basis, such as low-lying forested areas with predominant tree cover under 200 feet and pasture and range land. (2) OTHER DEFINITIONS.—The Administrator shall define such other terms as may be necessary to carry out this section. (B) may not be disclosed for purposes other than aviation safety, regardless of whether or not the information is marked or labeled as proprietary or with a similar designation.